After a recent visit to Vanilla Restaurant in Newcastle (review to follow), we thought we would try to recreate one of the dishes we had on our visit. Vanilla offer a great range of dishes but it was their duck and chorizo scotch egg with curry risotto that got our mouth watering. The dish was amazing; so impressed were we that we thought we’d try to make our own version of the dish. This dish can be the perfect starter to a 3 course meal for the family or a filling lunch or dinner for you to enjoy any day of the week. The pressure points in this dish are getting your egg boiled and deep fried perfectly and also ensuring that your risotto has the right texture. Let’s begin. Boil the eggs for 5 minutes and drain, before adding to ice cold water to arrest the cooking process. If you want your egg to be hard boiled, boil for 8 – 10 minutes. Take your chorizo meat and blend until a moose like texture has been achieved. Season lightly. Divide the meat mixture into 4 and squash the mixture into thin ovals on to cling film. Sweat the diced onions in a frying pan over a medium heat. Add the curry powder and mix well. Add the dry arborio rice and stir until each grain is coated well in the curried onion mixture. Mix the chicken stock with the wine and add 1 ladle of the liquid to the rice mix. Stir until the liquid has been absorbed and repeat this process until all of the chicken stock & wine mix has been absorbed. Once the liquid has been absorbed, continue cooking on a low heat and return to your scotch egg. Fry off half of your striped chorizo until crispy. Add the remainder to the chorizo and warm through. This is a 5 step process. Be sure to handle the egg delicately. Dry an egg and dredge in flour. Transfer the floured egg to the chorizo sausage meat mixture and mould the meat around the egg, ensuring even coverage. Dip the meat covered egg in egg. Roll the egg in breadcrumbs, and coat thoroughly. Once all the eggs have been crumbed, add to a deep fat fryer at 190C. Once in the fryer, cook the eggs for 3 – 4 minutes until golden. Chorizo is a cured meat so it does not need to be cooked for too long. Once golden, remove from the fryer and drain on kitchen paper. Our short Instagram video below shows you the different steps required to make your scotch egg. Spoon the risotto mixture onto a plate to create a bed for the egg. Split the risotto mix evenly into 4 portions. 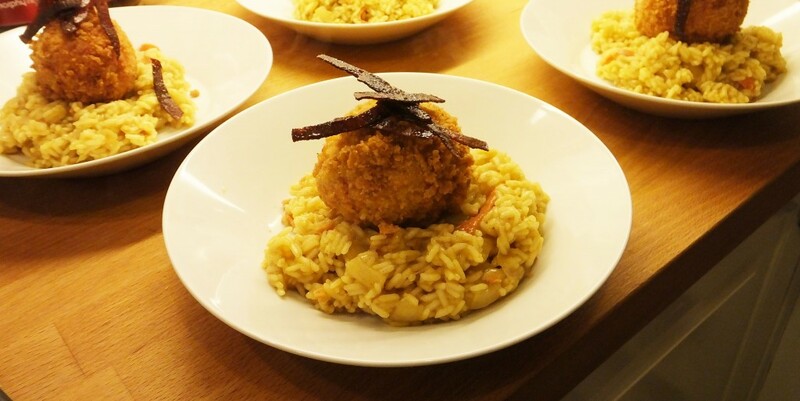 Place a scotch egg on the top of each risotto bed and garnish with the crispy chorizo that has been fried off. Serve and enjoy. 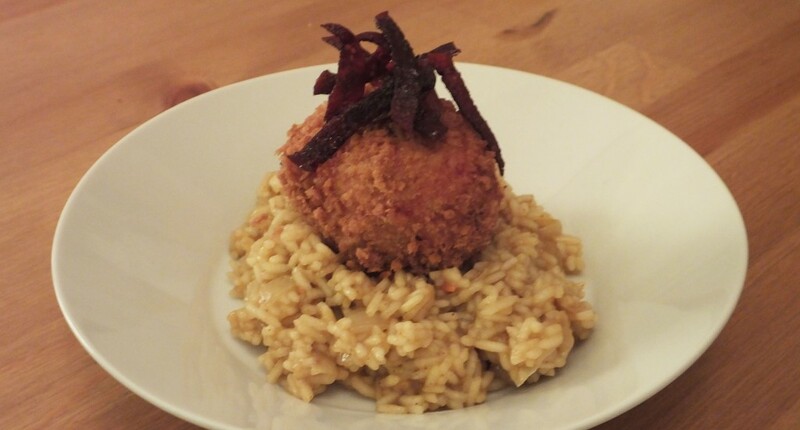 You can always experiment with other meats and flavours both in the scotch egg and your risotto mix. As previously mentioned, the main challenges in this dish are getting the egg cooked right and the rice cooked to the correct texture. While you may not achieve this first time, it will still taste great, and is something to cook to show of your skills when guests visit your home. Just be careful to gradually add your stock mix when cooking the risotto as you can always add but never take away. 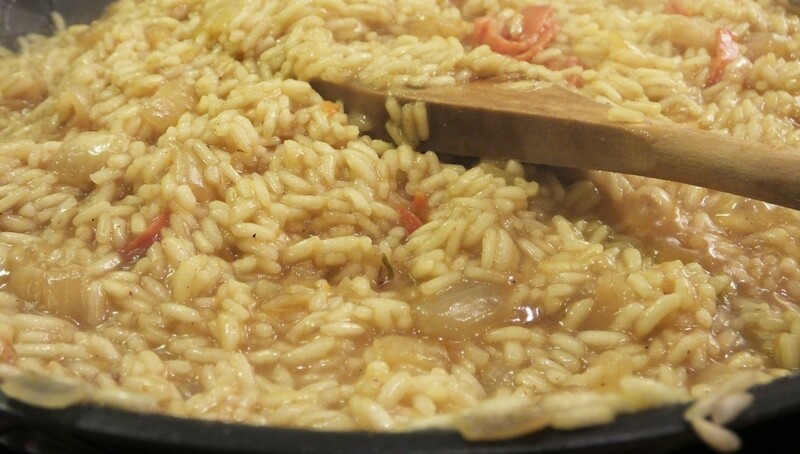 Constantly taste during the cooking process to check the texture of the risotto mix. Let us know what your favourite flavours are for risotto and if you’re a fan of a hard or soft boiled scotch egg by commenting below or connecting with us on Facebook and Twitter.